New Zealand faces allegations of spying on a journalist in Afghanistan with the help of US agencies over his coverage of NZ’s treatment of prisoners. Defense denies the allegations, while the PM says reporters can get caught in surveillance nets. The New Zealand Defense Force (NZDF) has reportedly put freelance journalist Jon Stephenson under surveillance and collected phone metadata while he was working for US news organization McClatchy in Afghanistan last year, Nicky Hager with the Sunday Star-Times newspaper revealed. Metadata can reveal information such as the location of the caller and the length of the call. New Zealand opened a probe into the allegations. Allegedly NZDF was able to track who Stephenson had called and who the people he talked to subsequently called, which created what is known as a ‘tree’ of the journalist’s associates. The goal was to identify Stephenson’s contacts and sources within the Afghan government and military. The surveillance was reportedly put in place after the government became unhappy with his reporting about New Zealand’s treatment of Afghan prisoners. Hager revealed that it was most likely the NZ’s Government Communications Security Bureau (GCSB) that monitored Stephenson, as it had posted staff to the US’ main intelligence center north of Kabul at Bagram and was capable of such monitoring. NZ Prime Minister John Key denied allegations on Monday stating that his country does not spy on journalists, but said there is a chance reporters could get caught in surveillance nets when the US spies on enemy combatants. Key said that it is theoretically possible that if a journalist called a member of the Taliban who was being watched by the US, he or she could end up in surveillance records. NZDF added that there is no evidence that its military or the US had spied on Stephenson. “We have identified no information at this time that supports [these] claims,” acting Defense Force Chief Maj. Gen. Tim Keating said in a statement. This is not the first run-in the journalist has had with the NZ’s government. 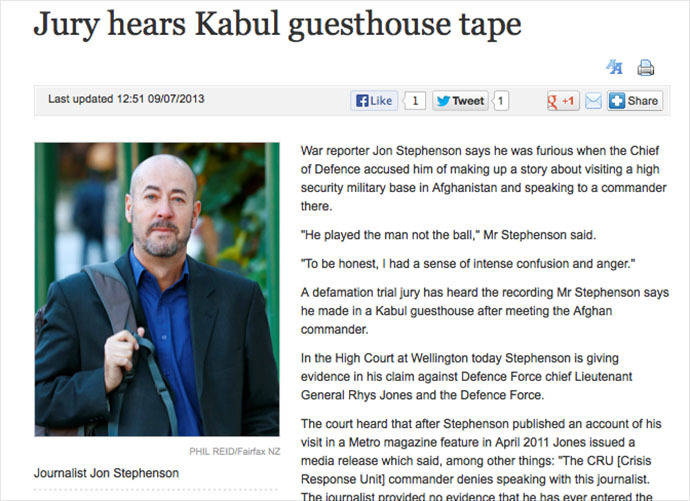 NZDF earlier implied that one of the interviews Stephenson published with Afghanistan’s unit commander about mishandling of prisoners was fabricated. Stephenson sued for defamation. During this month’s trial, the NZDF confirmed that the interview may have taken place. The trial ended with the hung jury. Advocate groups were outraged by what has unfolded. The Human Rights Foundation told Sunday Star-Times it was an abuse of fundamental human rights. In the meantime, the NZ government admitted to the existence of a secret order that lists investigative journalists as potential threats to security and puts them alongside other spies and terrorists. The order was first issued a decade ago and reissued in 2005. The US National Security Agency (NSA) sometime shares information with NZ, as part of the Five Eyes intelligence-sharing alliance, which also includes the UK, Australia and Canada. The news comes as thousands of people marched to protest a new bill on Sunday that would grant the New Zealand government sweeping spy powers, giving the GCSB free rein to listen in on citizens’ phone conversations. John Key has been playing down the nationwide protests, arguing that those involved in the mass demonstrations are ill-informed or have a political agenda. The US involvement with global spying has grabbed the world’s attention after the whistleblower Edward Snowden leaked information the extent of US spy programs.